Ready to wake up your taste buds? Try this as a healthy appetizer at your next pre-game party. This four-ingredient winner features crisp, fresh cucumbers topped by spicy buffalo sauce, sliced green onions, and blue cheese. 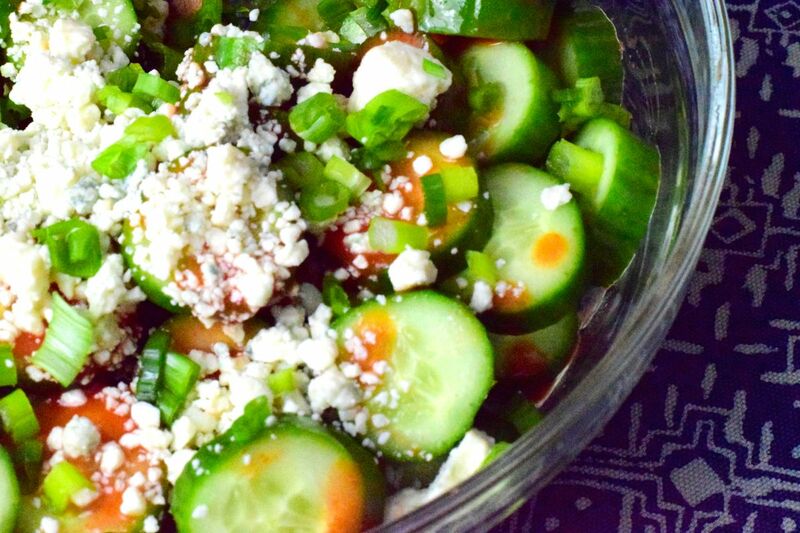 The recipe is inspired by a restaurant in my office building called Parm, which features classic Italian-American fare for the most part, but there was something on the appetizer list that caught my eye: Buffalo Cucumbers. Wait, what? I had to try it. I wasn’t sure if it would be a weird fried cucumber type of thing, but no, it turned out to be a fresh and spicy little salad! Because of my other adventures with Frank’s Red Hot sauce, I recognized the flavor and I knew I could replicate the dish at home. Ta-da! Mind you, I have NEVER finished a bottle of hot sauce before, and now we are on our second bottle of Frank’s. Somehow I am enjoying spicy foods more than I used to. It helps that my husband raves about buffalo everything. If it’s a little too spicy for you as is, try mixing in a tablespoon of two or plain yogurt. The green onions are my variation, and if you like celery, you could also add in some thinly sliced celery. I bet some thinly sliced shallots would be nice in place of the green onions, too. Wash and slice your cucumbers about ¼" thick (not too thin, you want them to stand up to the sauce). Toss with the sliced green onions and Frank's Red Hot Sauce, then sprinkle the blue cheese on top. That's it! Enjoy! !